‘I vow to thee, my country’ is one of the most popular of our national hymns. It is often sung at Remembrance Sunday Services and Royal events. It was written by a British diplomat, Cecil Spring Rice. He was was born into one of the well known political families of his day. His grandfather had served as Chancellor of the Exchequer in the Whig government [1835-1839]. Cecil Spring Rice had a privileged upbringing and was educated at Eton and Balliol College, Oxford. After graduation he took up a career in the diplomatic service. His first major appointment was as Chargé d’Affaires in Tehran [what was then Persia]. He also served in Sweden before being called as Ambassador to the United States. He was a great admirer of Theodore [Teddy] Roosevelt and was the President’s Best Man when he married Edith Carrow. Spring Rice had a successful diplomatic career and was instrumental in influencing President Wilson’s decision to enter the First World War. He was also a poet of some note. Most of his works were published posthumously in 1920. He wrote I vow to thee my country in 1908 while serving in Sweden. He entitled it Urbs Dei or The Two Fatherlands. The poem reflects on how the Christian is called to a dual citizenship. We “Render to Caesar what is Caesar’s and to God what is God’s” [Matt. 22.21]. Spring Rice had a great loyalty to the United Kingdom and to the Kingdom of God, and I vow to thee my country celebrates this. His words are typical of the nationalistic and religious sentiments of pre First World War Britain. The last verse,"And there's another country", is a reference to the Heavenly Kingdom. The final line is based on Proberbs 3.17, which reads in the Authorized Bible, "Her ways are ways of pleasantness, and all her paths are peace." The hymn sets the Kingdom of God as our goal and pattern for living. I vow to thee my country is often viewed as being too nationalistic in these politically correct days. Its popularity, however, endures. It was a favourite hymn of the late Princess Diana. Its appeal also owes much to the magnificent tune it is sung to. 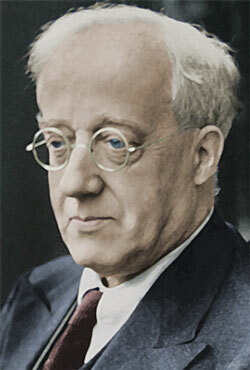 In 1921 the composer Gustav Holst adapted the melody of Jupiter from his suite The Planets, extending it slightly to fit the final two lines of each verse. He named the tune Thaxted after the village in Essex he lived in.